Need a little romance? When it comes to romantic getaways Cape Cod is the place to go. What can be more romantic than to grab a meal to go in Orleans, and have a picnic at Rock Harbor while watching the sunset over Cape Cod Bay? The best Cape Cod romantic sunsets can be found on this part of the Cape because the inner beaches actually face west (few places on the east coast do). As a result, you will be treated to a wonderful light display. If the sunset happens to sync up with a low tide, you can walk out onto Rock Harbor's expansive tidal flats while you enjoy the sunset. You will witness brilliant yellows and oranges as the sun begins to set. Then, the sky turns a magical shade of magenta and red. As the sun slowly disappears into the ocean, the assembled crowd erupts into applause (this is a group event). Sometimes, there is a steel drum band there to lend a festive vibe to the evening as well. Rock Harbor houses many of the nearby fishing charters and many of the boats return around sunset, making for great photo ops. When you talk of memorable romantic getaways Cape Cod delivers. 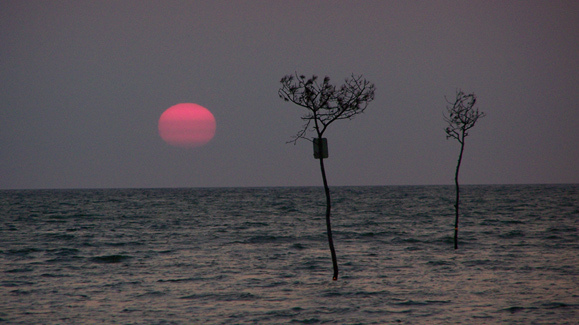 Your trip will not be complete until you've seen a sunset at Rock Harbor. 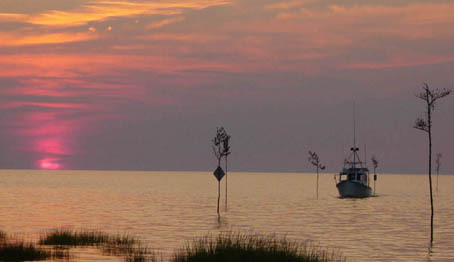 For romantic getaways Cape Cod offers other great places to view sunsets as well. Some beaches which are prime sunset viewing spots are "First Encounter Beach" in Eastham and Race Point beach in Provincetown. I highly recommend picking up some wine and cheese or maybe some subs to take with you. Cape Cod romantic getaways must also include a romantic picnic on the beach while you enjoy the sunset. Make sure you bring some bug spray because the "no-see-ums" come out at dusk and will make short work of your ankles. In P-town, the sun will set down the left hand side of the beach (Atlantic side), as the bend in the land starts to face west. 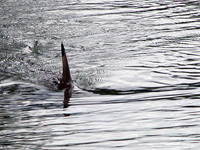 On more than one occasion, I have seen sharks swimming near shore here at dusk. I guess it is feeding time for them. So, would you rather dine-in somewhere instead and still catch the sunset? For your romantic getaway Cape Cod offers some excellent places to dine. Next to the Coast Guard station and across from the Sandwich Marina, is the "Aqua Grille Bistro." You can watch the activity along the Cape Cod Canal as fishing boats, pleasure boats and occasional ships pass by. Watch the sunset from the deck while enjoying fresh local seafood and an ice-cold beer. There's also "The Bookstore and Restaurant", (overlooking Wellfleet Harbor) which has great views and fresh seafood. When it comes to romantic getaways Cape Cod has some great upscale places if that is more your style. You should make a point of visiting "The Chatham Bars Inn." It is expensive but is a real treat. The restaurant is set high on a bluff overlooking the Atlantic Ocean. You can try one of the many wines they offer, while sitting fireside. Their potato leek soup is awesome! 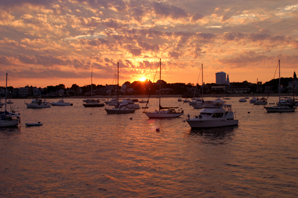 No Cape Cod romantic getaway would be complete without a harbor cruise from Provincetown. You can experience the beautiful sunsets away from the other tourists aboard a boat. You can watch the sea birds return to roost on the breakwater at dusk. You can also witness the flurry of vessels coming back to MacMillan Wharf after a long day of fishing. Some of these cruises even offer complimentary hors d'oeuvres and refreshments. You can go as a small group or even hire a private boat for just the 2 of you if you prefer. When it comes to romantic getaways Cape Cod is known for its beaches right? So why not make a trip to the beach at night? One of my favourite things to do while on Cape Cod, is to go down to Coast Guard Beach at night and have a romantic fire right on the beach. There is something about hearing waves crash and the crackling of the fire at the same time. 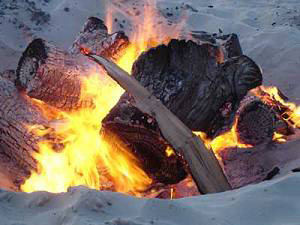 Permits for beach campfires at the National Seashore's six swimming beaches, are available at all park visitor centers. Reservations can be made up to 3 days in advance by calling the Salt Pond Visitor Center for beaches in Eastham and Wellfleet. For beaches in Truro and Provincetown, you need to call the Province Lands Visitor Center or you can go in person to the visitor centers after at 9am. Only three permits per day, per beach are issued. Since the permits are free, they often go very quickly. Want to get married on the Cape? Talk about Cape Cod romance! If you are thinking about getting married here (maybe a nice beach wedding? ), you should check out the Cape Cod Weddings page. So you see, when it comes to romantic getaways Cape Cod is the ideal place. Whether you want romantic dining, campfires or a stunning sunset cruise, it has it all.